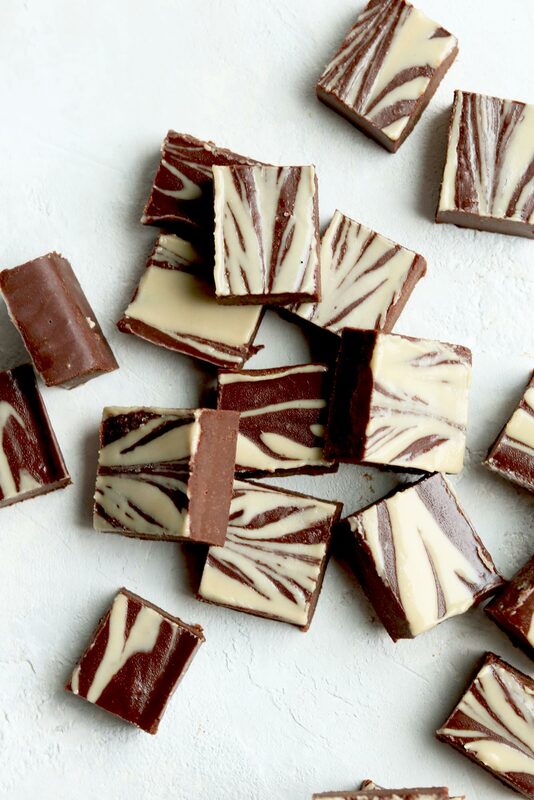 Inside Scoop: Does your favourite fudge recipe also act as a stress-busting treat? 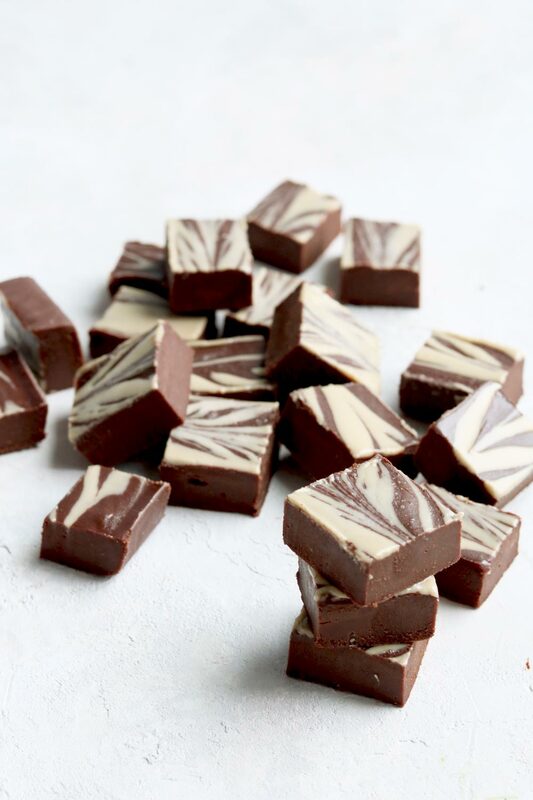 Check out this Tahini Drizzle Maca Fudge and let us know what you think. We hear you. We feel busy busy too, and sometimes that busy busy adds up. It’s like being busy, on-the-go and having all of these social standards to live up to is normal. However, our bodies haven’t quite adapted to the modern-day onslaught of chronic stress (which is also our bodies inability to take it slow). It’s really no ones’ fault that we feel overworked, overwhelmed and not quite aligned or balanced with everything that we WANT to do to succeed in life. But, what would you say that in order to better adapt there are certain herbs, powders, and supplements that you can take to create homeostasis within the body? These herbs are called adaptogens https://www.healthline.com/health/adaptogenic-herbs, and it’s literally what they help you do – adapt. So, what’s an adaptogen anyways? It may be one of 2019’s hottest health buzzword, but ‘adaptogens’ have been around for centuries and they’re not going anywhere anytime soon. Adaptogens are non-toxic plants that, when ingested, help balance out your body’s stress response. Though more research is needed for the efficacy of adaptogens, it’s believed that they work through communicating with the HPA axis, and the sympathoadrenal system both of which are involved in your body’s ability to deal with stress. We’ve been using adaptogenic herbs in both our practice and personal lives for years, some of our favourite being: maca, holy basil, rhodiola and ashwagandha. Though drinking herbal holy basil tea or popping back a few rhodiola pills can be part of a well-rounded health routine, one of our favourite things to do is to experiment with adaptogens on the culinary side of things. And we are so lucky to be partnering with an amazing bossbabe and total wellness nerd, MeByKiki to contribute to her Adaptogen cookbook (filled with goodies like muffins, this Maca Fudge, lattes and more…) which you can download here. Kiki is incredibly well-read when it comes to adaptogens and has put together an amazing guide that teaches you how to add adaptogens to your meals. This guide lays out exactly what part of the body each adaptogen works best for and exactly how to use them in your cooking experience. We highly recommend reading How to Incorporate Adaptogens Into Your Meals. And with all things adaptogen we thought it would be wise to contribute a delicious (chocolate based) recipe to her cookbook. 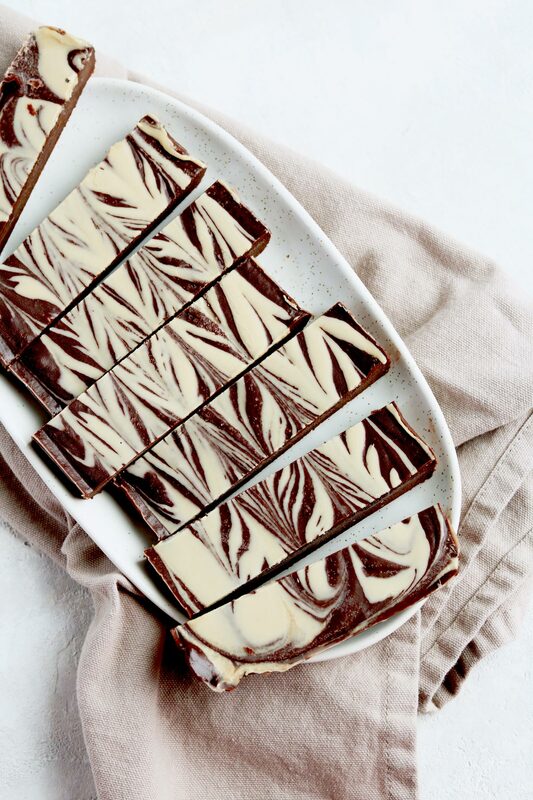 Hello Stress-Busting Tahini Drizzle Maca Fudge! This maca fudge recipe is an adaptation from one of our top recipes, our 5 Ingredient Peanut Butter Fudge. This time we’re swapping out peanut butter for tahini, adding some maca to the mix, and some cinnamon spice to kick it up a notch. What we love about maca (relative to a radish BTW) is the fact that you can use the whole root in your cooking or grind it down into a powder. Uses date back thousands of years for conditions like anemia, fertility issues, chronic fatigue syndrome, athletic performance and to boost memory. 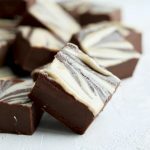 We figure, why not combine the stress-busting, energy promoting benefits of maca with the serotonin promoting benefits of chocolate in this Tahini Maca Fudge. MMMKAYYYY….. you know us, and all things chocolate is how we roll. Make sure you step on this maca fudge train and learn more about how you can incorporate adaptogens into your cooking routine by clicking here. Do you have a favourite adaptogen, or even a favourite way to use them? 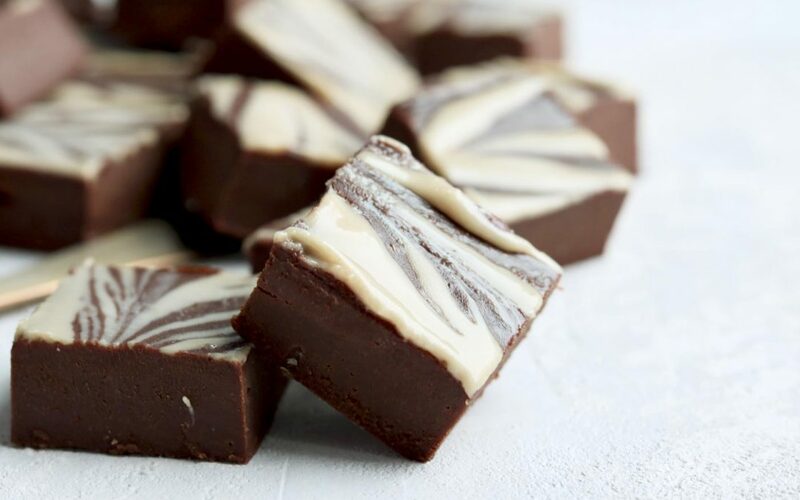 Does your favourite fudge recipe also act as a stress-busting treat? 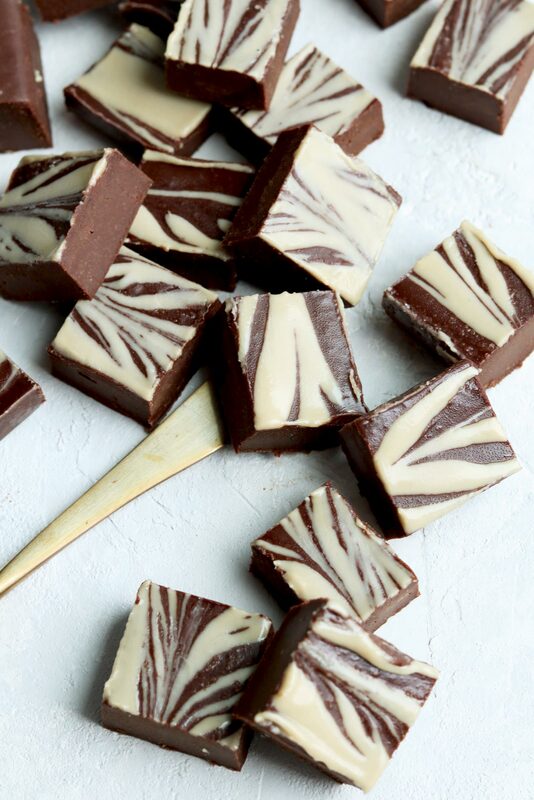 Check out this Tahini Drizzle Maca Fudge and let us know what you think. Add all of the ingredients, except sea salt and extra 2 Tbsp tahini in a bowl and whisk until thoroughly combined, creamy and smooth. Take a bread loaf and line with parchment paper. Pour fudge into loaf pan and sprinkle with sea salt. Store in fridge or freezer! Take a couple of spoonfuls of tahini and drizzle over top of the fudge (alternatively, you can do this with any nut butter – almond or hazelnut work nicely too).